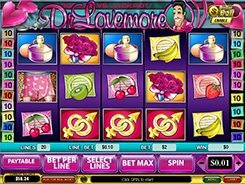 Dr Lovemore video slot produced by Playtech confirms once again that one who is lucky in love is lucky in game. 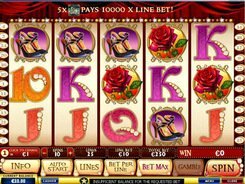 The five-reel slot machine has a coin jackpot of 10,000 that will be paid to the most affectionate and persistent gamer. The coin value varies from $0.01 to $2. The license plate represents the wild card. Like in other slot games, the wild replaces missing symbols and completes winning combinations. The peephole through which the Doctor is looking at something extremely tempting is the scatter symbol. Get five scatters in any position and be awarded with a win of x250 the bet. The Pink Pants is the bonus symbol that appears on reels 1 and 5 and gives 20 free spins with x2 multiplier. During the bonus round, free spins can be retriggered. So don’t worry to lose your shirt since you are going to win big with the Pants symbol! On starting the Gamble feature, you get a chance to increase your assets with just one mouse click. Pick a card, and if it turns out to be higher than the dealer’s card, you win. In case of a draw outcome, your winnings are neither doubled nor cut. PLAY FOR REAL MONEY!